Today I'm sharing the dress I made as part of the Vogue Patterns Cocktail Hour Sewalong. The sewalong was launched in March by McCall's to raise money for The Eve Appeal - a charity that funds research into gynaecological cancers. 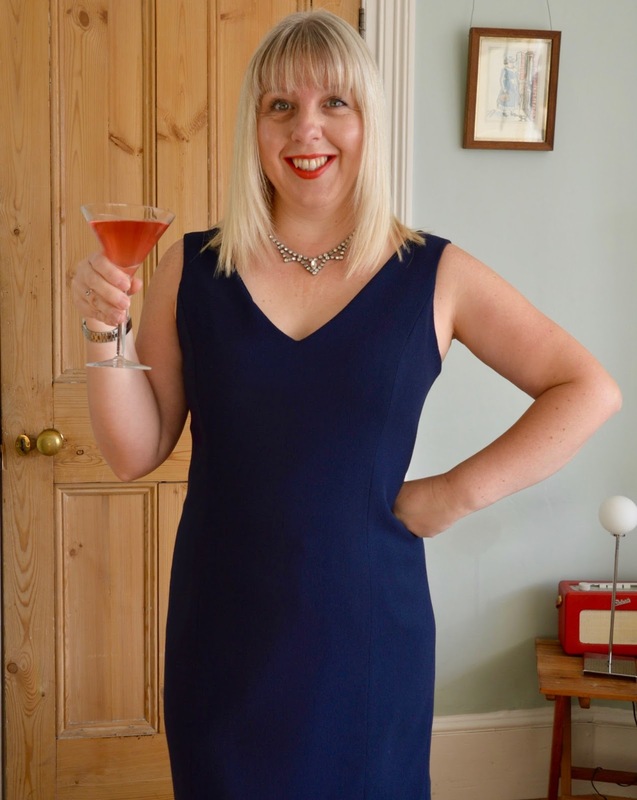 26 sewing bloggers have been taking part in the blog tour since then, sewing up their choice of 20 specially selected Vogue evening wear patterns. Money raised from the sale of each pattern will go to the Eve Appeal, so anybody who buys one will be directly supporting the charity. You can check out what everybody else has been making by using the hashtag #sipandsew on Instagram and Twitter. When it came to choosing my pattern, I was looking for a simple design that wouldn't require much brain power to sew. Vogue 1536 seemed to fit the bill perfectly - an elegant princess-seamed cocktail dress by American designers Tom and Linda Platt. The pattern also comes with a strange Mel and Kim-style cropped bolero jacket, which you'll be pleased to hear I disregarded. I was only ever interested in the dress. With such a simple design I knew that fabric choice would be key and spent a looong time making my mind up. 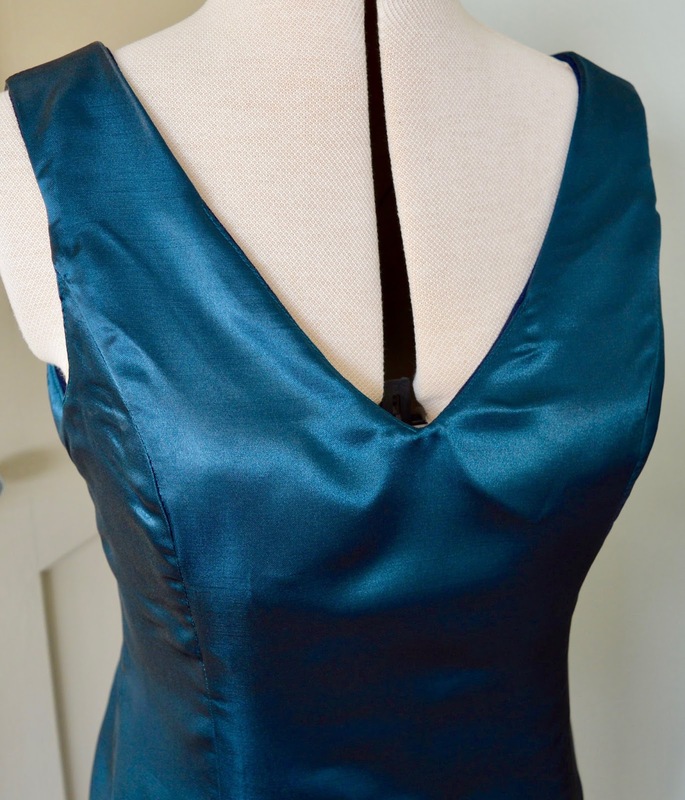 I finally decided on an Italian wool crepe from Til the Sun goes Down for the main dress and a shantung satin from ClothSpot for the lining. The navy colourway I used is no longer in stock unfortunately, but here's the link to another blue. The lining fabric is also sold out - sorry! The crepe by itself is quite lightweight but takes on a completely different feel with the lining added. 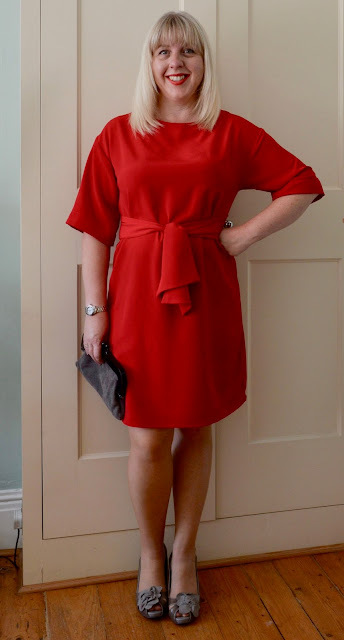 The shantung satin adds structure and weight to the dress and it feels very luxurious to wear - exactly what you want from a cocktail dress. 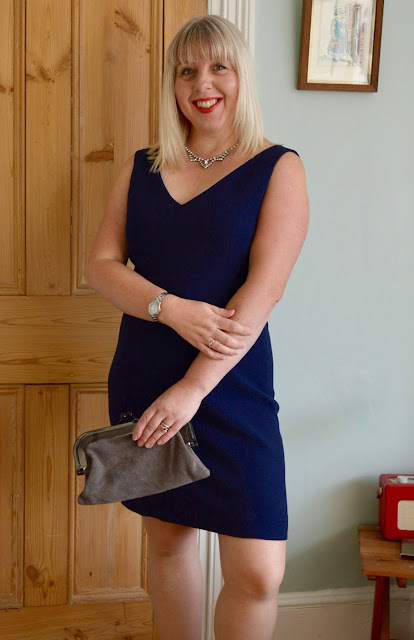 The wool crepe is expensive (£32 a metre) but reasonably wide, and with a bit of clever pattern placement I was able to get away with using just one metre for my dress. You'll be relieved to hear that I did actually make a muslin before cutting into such posh fabric! I'd read in a few reviews that the dress ran large, so cut a size 12 which was one size smaller than my measurements. 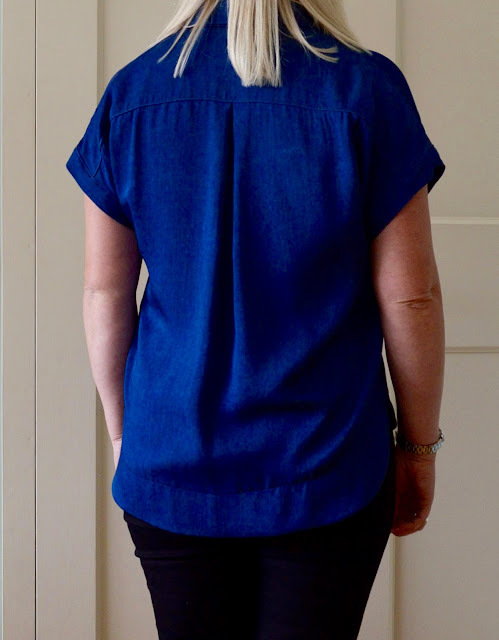 I used the petite shortening lines at the waist only (you can also shorten for petite sizes at the hips) as the finished length is already quite short. The only other adjustment I made was a 5/8" tuck across the back piece as the V back gaped slightly on the muslin. There wasn't anything untoward about the pattern and the construction was relatively straight forward. 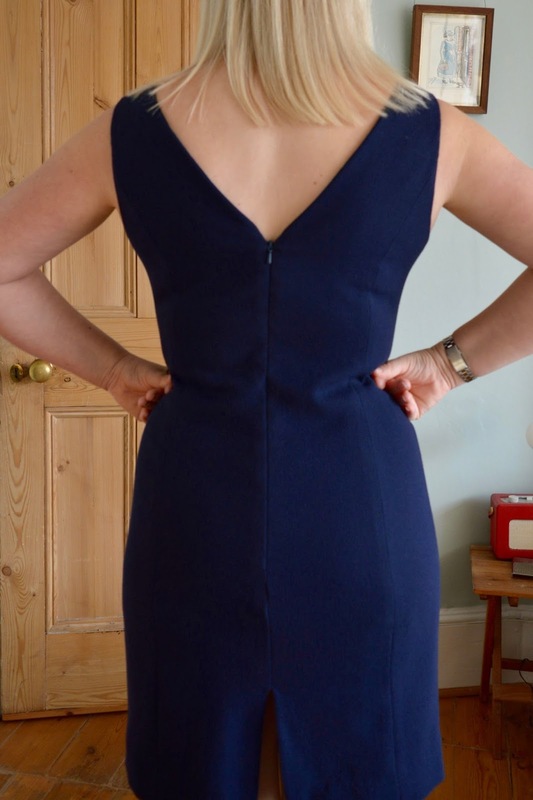 The only thing that leapt out at me was the lack of instruction to stay stitch the V front and back necklines. Yes, it's an obvious step, but I really think it should have been included - these areas are both cut on the bias and the last thing you want is a stretched out neckline. I also ditched the instructions when it came to adding the lining as there was far too much hand sewing for my liking. I attached the entire lining by machine, apart from the area around the back split which I hand stitched. I also hand stitched the dress hem. 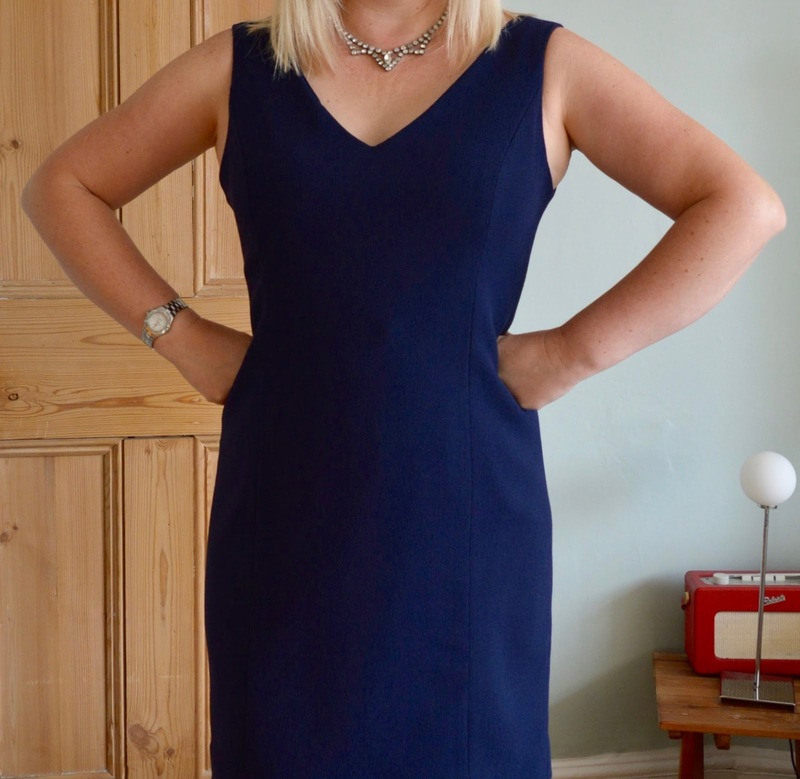 For such a simple dress I did have to spend an enormous amount of time with a steam iron and a clapper pressing the curved princess seams flat. Luckily for me, the wool crepe was a dream to manipulate and I'm really happy with how well the seams pressed. I think they're worth the extra effort. I have to say, this is a gorgeous dress: simple, classy and a great fit. It isn't super fitted, but the subtle shaping of the princess seams really shows off your curves, which I like. It's very me and I'm glad I kept it simple when it came to choosing the pattern. Cheers! The pattern and a fabric allowance were kindly provided by McCall's. All views my own. I've had my beady eye on the Closet Case Files Kalle pattern ever since it was released. 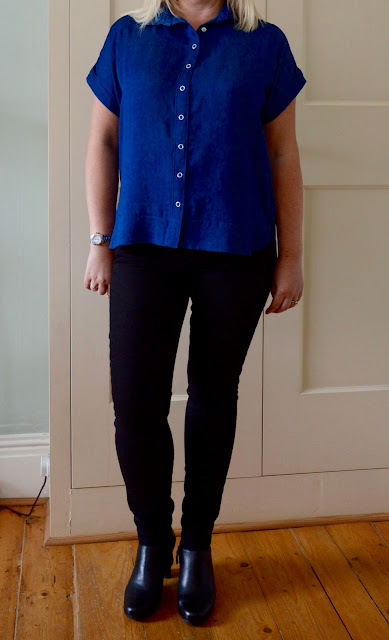 Despite being loose fitting, the body skimming silhouette really does seem to flatter all shapes so I convinced myself to step out of my usual fitted shirt comfort zone and give it a go. Two versions I've been particularly swooning over are Sallie's tencel denim shirtdress and Lauren's cute cropped shirt version. The pattern comes in three lengths: cropped, tunic or shirtdress, with a multitude of options for the collar, placket and back pleat. 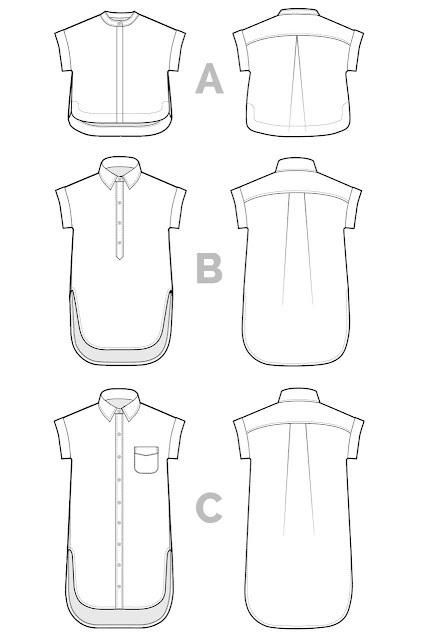 I decided on a mixture of Views A and C - the faced hem and inverted pleat of view A and the traditional collar and button placket of view C.
I also thought long and hard about which size to cut as there's a lot of ease in this pattern. I was sorely tempted to size down, but after reading a few reviews I cut the correct size for my measurements (size 8) to ensure a good fit across the shoulders. I added 2.5" length to the back piece and 5" to the front piece and button band as the original cropped length of View A is very cropped. I'll lengthen the front piece even more next time as my bust makes the shirt ride up a bit higher than I'd like. The instructions are reasonably comprehensive and there's also a Kalle sewalong on the blog which goes through all the trickier steps in greater detail. I'll admit, I did need to refer to the sewalong for the yoke (my mind went blank, even though I've sewn 'burrito' yokes loads of times!) I also needed it for the sleeve cuffs - they're not particularly complicated to sew, but I think the instructions would have benefited from a few more diagrams. I had no problem with the collar however as the pattern uses my favourite Four Square Walls method for construction. 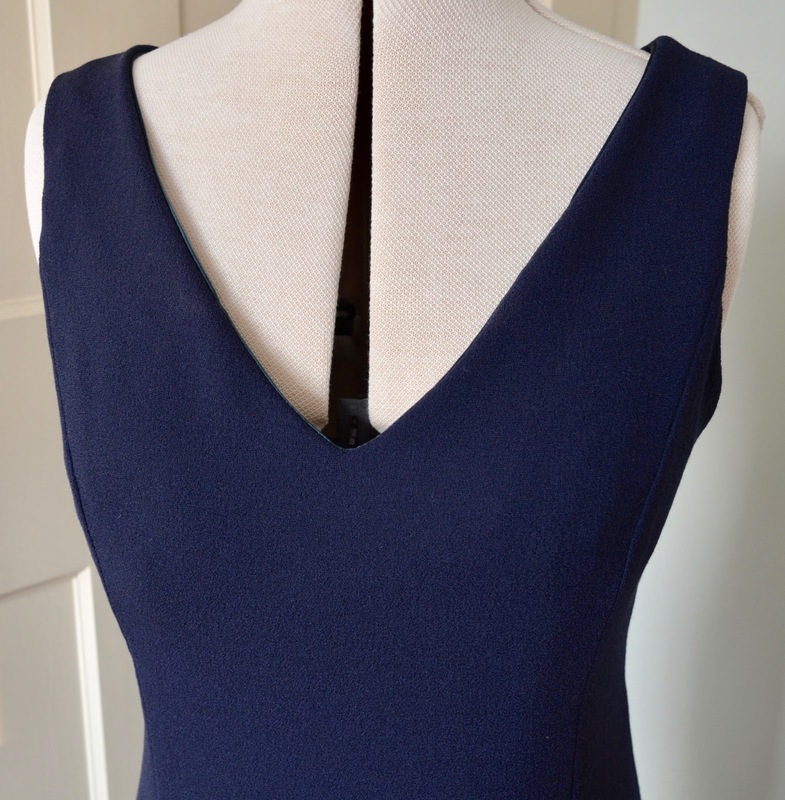 There's even a separate smaller pattern piece for the under collar so you don't need to trim it down, hoorah! I've now made several traditional shirts/shirtdresses with collars, but for some reason I still find the process quite daunting. This time I was determined to enjoy it, so I broke the construction down into five achievable chunks: button plackets, yoke, hem facing, collar and sleeve cuffs. It worked a treat - each chunk is substantial but not too overwhelming and you can see real progress at the end of each stage. I struggled most with the facing, probably because of the accuracy needed to get a clean, sharp finish around the curved hem. It's not my best work - mine isn't as clean and sharp as I'd like and there's still a bit of rippling along the hem, but I can live with it. I also managed to avoid a whole construction step (buttons and buttonholes) by paying a quick visit to DM Buttons in Soho and getting them to add snaps for me! With hindsight I should have added one to the hem/facing area as well as it has a tendency to gape open. Never mind. Eight snaps for a fiver, bargain! 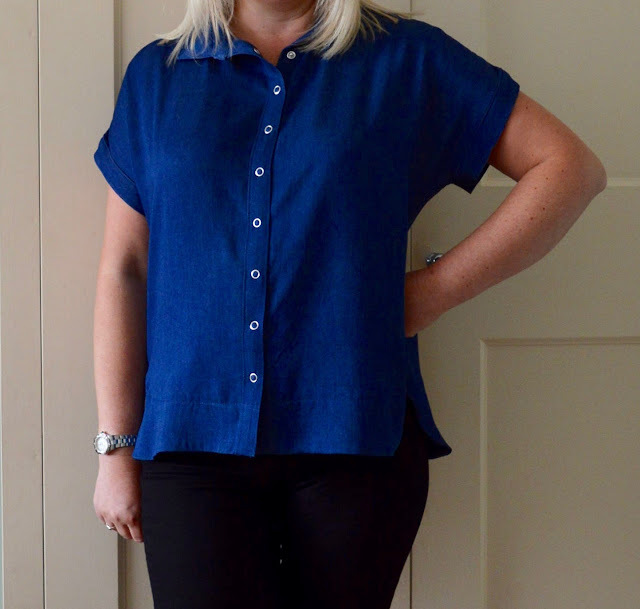 For fabric I blatantly copied Sallie and made my Kalle shirt in a tencel chambray. 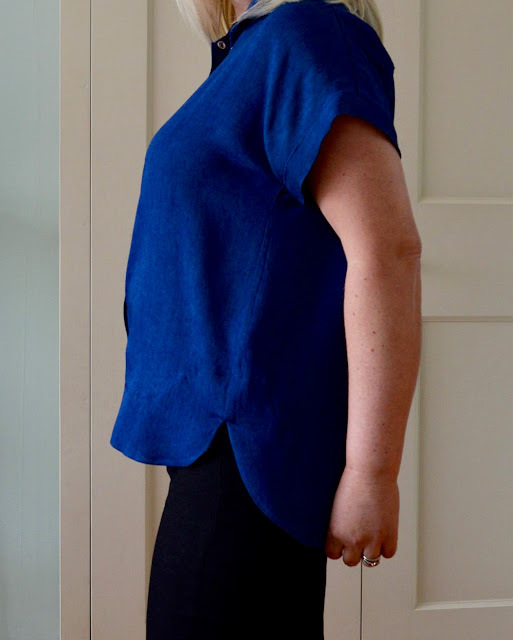 As far as I can gather from a quick Google search, tencel (or lyocell as it's sometimes known) is a sustainable fabric made from wood cellulose, very similar in drape and feel to rayon. 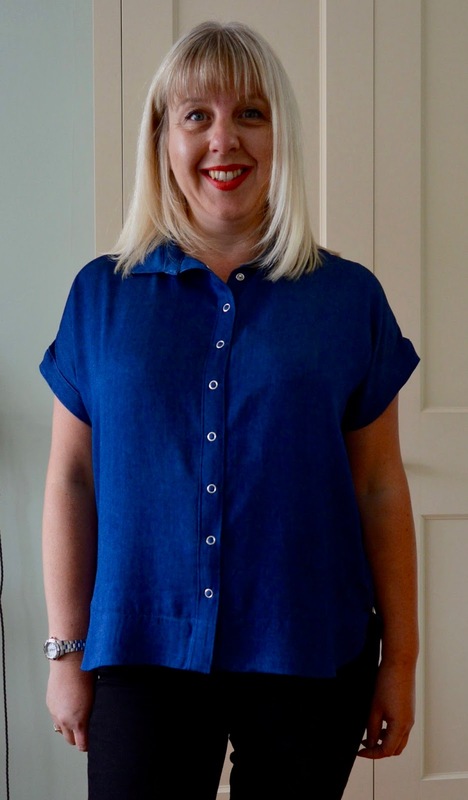 I'd agree with this as the chambray I used was not like chambray I've sewn with in the past. The depth of colour, the drape and the soft feel of the fabric are all noticeably different (in a good way) to a standard chambray. 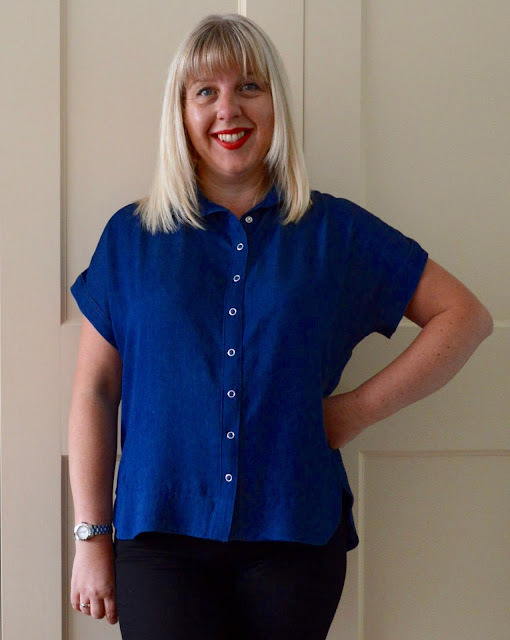 I found it quite difficult to source tencel in the UK and eventually tracked some down at German based myfabrics.co.uk. I've had a long standing offer from the company to try out one of their fabrics and this seemed like the perfect time to take them up on it. The fabric arrived promptly and was even nicer than I'd envisaged. It washes and presses well and even though it has a similar drape to rayon I found it slightly easier to handle and sew as it doesn't shift around quite as much. It does, however, fray and shed fibres as soon as you look at it, so I was mightily relieved when all seams were concealed or finished. I should also point out that I had to lighten these photos (it was a dreary day when they were taken) so the blue colour of the fabric isn't as bright in real life. Fabric was given to me free of charge by myfabrics for review. All views my own. 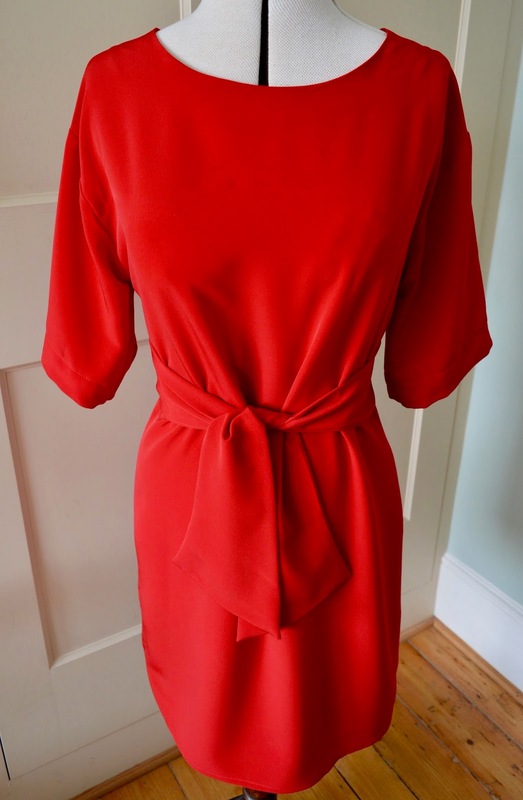 I first decided to make this dress after spying a stunning red tie-belt number in a department store. Lovely as it was, the price tag was over £200 and I convinced myself I could make my own version. 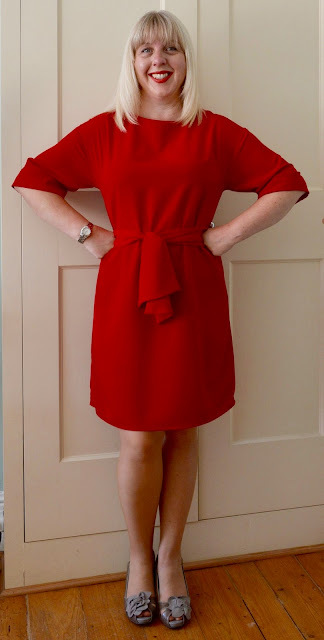 Coincidentally Laura from Sew Different had recently contacted me to see if I was interested in reviewing a pattern, and by great good fortune the Tie Belt Dress was very close to the shape and style I was after. Although I did struggle with some aspects of the pattern and instructions, the end result is just what I was hoping for. The dress is a softly fitting A-line shape, with darts to the back, a waist tie belt for definition and a high/low hem. There are no finished measurements given, so I chose the size closest to my actual measurements - a UK size 12 - which fits me reasonably well. The instructions are quite basic, but that wasn't a problem for me as as the dress is a very simple shape. There were one or two parts that did have me scratching my head though. Firstly, the grain line arrows are shown going in two different directions. I checked this with Laura and apparently this is to indicate the weft and the warp, but I still found them confusing. Secondly the cutting layouts show the pattern pieces cut on an unfolded, single layer of fabric, even though all pieces are cut on the fold - bizarre! I decided to sew the sleeves as drafted before making a decision on length. As it turned out, they were too long on my short arms with the trim attached. Rather than shorten them, I simply turned the trim to the inside to act as a facing and top stitched it down, easy! Construction was very straight forward - the only thing I'd say is to keep an eye on the position of the black dots for attaching the tie belt. The dot positions are for guidance only and may need moving up or down to align with your waist (I needed to move mine up). The instructions also have you attach the tie belt quite early in the proceedings, but I'd recommend waiting until the whole dress is constructed before pinning them into place. That way you get a more accurate idea of your natural waistline. For fabric I went against the recommendations (light denim, needlecord, heavy cotton etc) and chose a luxury crepe from Sew Over It with a nice drape. I think the original shape of the dress in a weightier fabric would have looked too sack-like on me. The drapier fabric worked well and was close to the fabric from the original inspiration dress. At £14 a metre it worked out much cheaper to make my own version too! A copy of the Tie Belt Dress pattern was given to me free of charge for review. All opinions my own.